You want to save your repetitive research tasks with complex Boolean logic, multiple facets and specific databases to track new publications from an array of disciplines? LibSearch offers you a new service. From now on it is possible to reproduce your research queries repeatedly to your user account. After authenticating you will see the option to save the search under “Search Tools”. 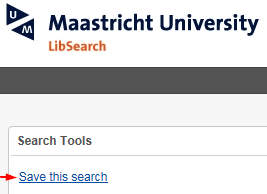 With your LibSearch user account you may save up to 100 searches and manage these searches from your account page. Clicking “Save this search” produces a confirmation of the saved search criteria with an action to view saved searches. You have access to your saved searches from the navigation bar or from the dropdown menu in your account. 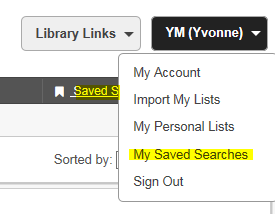 When you want to view, re-run or delete your saved searches, go to your account details.